Apple, Huawei, and Microsoft also had excellent fourth quarters and all three vendors showed growth for the full year as the tablet market shows signs of recovery. Shipments contracted 1% in Q4 2018 and ended the year 6% lower at 173.8 million units. BOSTON--(BUSINESS WIRE)--The latest research from Strategy Analytics showed that several major vendors had very happy holidays in 2018 and Samsung posted its first global quarterly shipment growth since 2014 . Apple, Huawei, and Microsoft also had excellent fourth quarters and all three vendors showed growth for the full year as the tablet market shows signs of recovery. 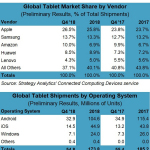 Global Tablet market shipments contracted 1% in Q4 2018 and ended the year 6% lower at 173.8 million units.